Is the image above missing? View it here. This page is an overview of Vashti’s crochet class topics, with lots of student feedback received. Be sure to check Upcoming Classes & Events. These topics have been presented as three-hour classes at national crochet conferences and yarn shops, as well as in three-day workshop formats around the USA. Contact Vashti about teaching crochet classes and workshops for your group. Creative Planned Color Pooling is the 2018 edition of the 2017 Stacked Color Pooling and 2016 Stitch Games. Self-Healing Crochet Stitches and How to Cut Them is the 2018 edition of the 2016 Steek Tunisian Crochet Lace for Fun Fast Fashions (added regular crochet in 2017). Vashti’s Crochet Classes Consistently Sell Out. Contact Vashti about developing crochet classes and workshops tailored to your group. Here’s what students say about them (culled from anonymous class evaluations). I have learned more than I ever imagined possible in 3 hours. Vashti is an amazing teacher, so generous and very, very talented in the teaching department. Thank you, thank you, thank you! This class was challenging – really stretched my mind to new limits. Ms. Braha is so calming and patient. Excellent! So much new information! Yay! More Vashti, more slip stitch! Best class ever! Thank you! Flower-like love knots of the Electra Wrap. Vashti is a natural teacher – very organized and clear! A joy of a class! Excellent class! I’m a new crocheter and it was accessible and challenging. Loved this! Will definitely use it. Well researched, plenty of resources, swatches, projects. Always enjoy Vashti’s informed teaching style! This was a wonderful class!! I really learned many new techniques that I can’t wait to try in designing. Thanks, Vashti! Great class! I want more!! Lots of info. 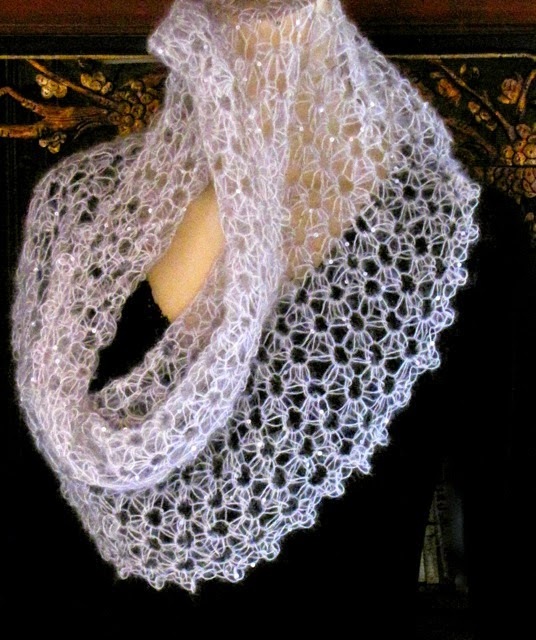 The eyelet lace design that inspired the earliest Tunisian lace classes: Weightless Tunisian Wrap. Vashti has brought Tunisian to the next level! I am addicted to the new technique that we learned! Great class. I loved this course! 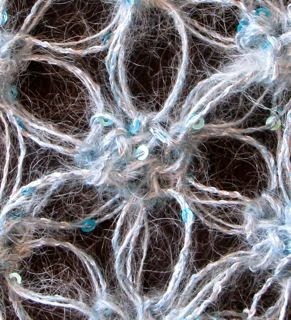 I’m excited about new Tunisian stitches and techniques – thanks! Innovative, taking Tunisian to new heights! Great visuals – large swatches, projects. Awesome! Great instructor and fun techniques. Very detailed, learned a lot. Great website & blog. Love the designs. Thank you! Terrific class – really appreciate Vashti’s historic perspective on the art! Great class! Enjoyed and learned some great new ideas. Well-paced class – she was excellent! History, resources, technique – can’t wait to do more. I especially like introducing the historical perspective & designers of old! Not only is Vashti very knowledgeable but her very fun and friendly character adds so much to the class and inspiration. Very good class – instructor knowledgable – great teacher! Fabulous handout. Good information. Clearly Vashti knows her knot stitch. Great workshop – neat samples. Learned new techniques, great class. This was my first crochet class. It pushed me and inspired me. I can’t wait to get to work (play). Really a great class! I’m already dreaming up design ideas. Love the class, great teacher, great tips. Learned more than I expected–very interesting class. Great class – lots of info. I never knew the slip stitch could make such a beautiful fabric & that it’s so versatile. Fabulous! Instructor made me feel as an equal – which was delightful. Super friendly and passionate. I left with a great appreciation for a stitch that I once didn’t value. I look forward to dreaming about all the possibilities. Thank you! Makes me want more–great class! So, so great! Learned lots and had fun. A joy! Learned so much. This could be very useful in garment design. Thanks Vashti! Very interesting! Learned some new techniques that will be fun to use in future projects. Excellent class – learned a lot! Instructor was very patient–she took the time the students needed. Was unfamiliar with this type of crochet so did not always understand. She was very good! Enjoyed looking through all the samples that Vashti brought in. They were very inspiring. Vashti was very enthusiastic when teaching the class and I think that spread throughout the class. Vashti is a gentle teacher who is very patient! As a beginner, I was unsure but instructor was very good, easy to understand. Very interesting. Learned a lot and will use this in my work. Thanks so much for offering this wonderful class! Vashti is very calm and that makes her very easy to listen to. She does an awesome job! This workshop was filled with so many exciting possibilities for future projects! I enjoyed learning the history too. Great history of techniques. Fascinating. Vashti is really great at communicating and seeing where we go wrong (or think we do) and pointing out and explaining how to fix and when we are right.